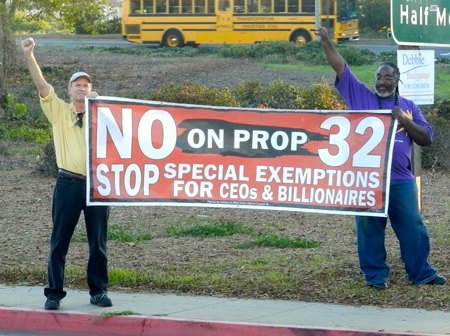 Freelance unit member Paul Burton, who is editor of San Mateo Labor, campaigns against Prop. 32 with Whitfield McTair of SEIU United Service Workers West. Photo courtesy of Shelley Kesseler 2012. When Paul Burton was a teenager, he got an old-school education about organized labor that stuck. It began when he worked with his father, a union brick layer. Burton mixed cement and carried bricks, and wiped the sweat off his brow as he developed a respect for union workers. Now he’s a labor writer and editor, and his respect for union workers keeps growing. Burton, an active member of Guild Freelancers, enjoys telling the human stories of workers. Like the city tradesman who was called out of bed in the middle of the night to fix a water main, thereby preventing a disaster. That work’s crucial, Burton insists, and it deserves good union pay – not a wage cut. Tall, lanky and in his early `60s, Burton reports on salary and health care issues as well as pensions and organizing. He tracks activists and political issues, like the latest trade pact, the Trans-Pacific Partnership. Is it going to destroy livelihoods? Hurt the environment? Accelerate the global race to the bottom in wages and working conditions? That’s for him to find out. Burton is a die-hard newspaperman at a time when the industry is being gutted. He relishes the small newspaper scene, putting out a monthly – 8-12 pages – focusing on what unions are doing to survive in tough times for workers. San Mateo Labor is one of the last remaining labor newspapers in Northern California. Its 8,500 circulation helps Burton keep his finger on the pulse of machinists, plumbers, carpenters, electrical workers, and even stage hands. He also gets stories from blogs and union leaders. He follows labor policy in Sacramento and Washington, D.C., and when he can’t write it he gets an insider to do it. The soft-spoken Burton likes working with people who are improving their communities, and feels like he’s making a difference, too. He wrote about single payer health care before many unions had an opinion on it. Later he saw unions take up the charge. “I think I made an impression,’’ said Burton. He shot photos of the San Francisco march against the Iraq war in 2003. At the time, the AFL-CIO didn’t take a stand on the war. But many leaders of the march were union members, and Burton published pictures of them marching with their union placards. Eventually, the AFL-CIO came out against the war. Writing about unions is almost a lost art. Few mainstream papers have labor reporters anymore, so union coverage is scarce. As politicians and corporations attack unions, they misinform ordinary people about the historic value of organized labor. Burton hopes his truth-telling can help trump some of that. Sometimes those messages of solidarity, improved pensions, better wages and benefits resonate in songs or chants. Burton doesn’t flaunt it, but as a musician he occasionally uses his guitar to strum a good labor song. Sometimes he writes the words himself. Paul Burton, editor of San Mateo Labor Council bulletin, plays guitar at a union meeting. Photo courtesy Paul Burton 2014. “Music energizes activists and union members,’’ he said. Burton remembers his dad telling him about unions when they were strong, back in the day when organized workers represented nearly a third of the US workforce. Tim Simmers is a freelance writer. He can be reached at tsimmers@netzero.net. We love our work profiles members of Local 39521.